The Serbia National Flag was finally acquired in 7th April in the year of 1992.The ratio of the flag is described as 2:3. Between the 6th and 7th centuries, a south Slav people called the Serbs moved into the region of present-day Serbia from the Carpathian Mountains. By the 8th century, the Byzantine empire invaded the region and remained to rule Serbia until the 11th century. After which, two states emerged: the Zeta of the east or also known as Montenegro, and the Raka of the west. When the Zeta state declined, the state of Raka became the center of power, where they remained as rulers for over 200 years. The most successful Raka dynasty was that of the Nemanjid, whose rule gave birth to the rise of the Serbian Orthodox Church. In 1389, Serbia fell to the Ottoman Empire, where it remained a state of the Empire until the 19th century. Revolts and rebellions took place soon after and in 1878, Serbia was granted full independence by the Treaty of Berlin. In 1913, Serbia expanded its territory through the Balkan Wars victory, but it wasn't until 1918 that the country was recognized as an official independent state by the rest of the world. After the 1st World War, Serbia was coerced into joining the Kingdom of the Serbs, Croats, and Slovenes, which was later renamed to Yugoslavia in 1929. The union remained intact until 1992 when Croatia, Slovenia, Macedonia, Herzegorina, and Bosnia declared independence. The only remaining states of Yugoslavia were Montenegro and Serbia - where in 2003, the union's name was changed to the union of Serbia and Montenegro. The brutal war in Kosovo in 1998 caused Montenegro to distance itself, and by 2006, Montenegro declared independence. The Republic of Serbia declared itself successor of the union and took its seat in the United Nations. 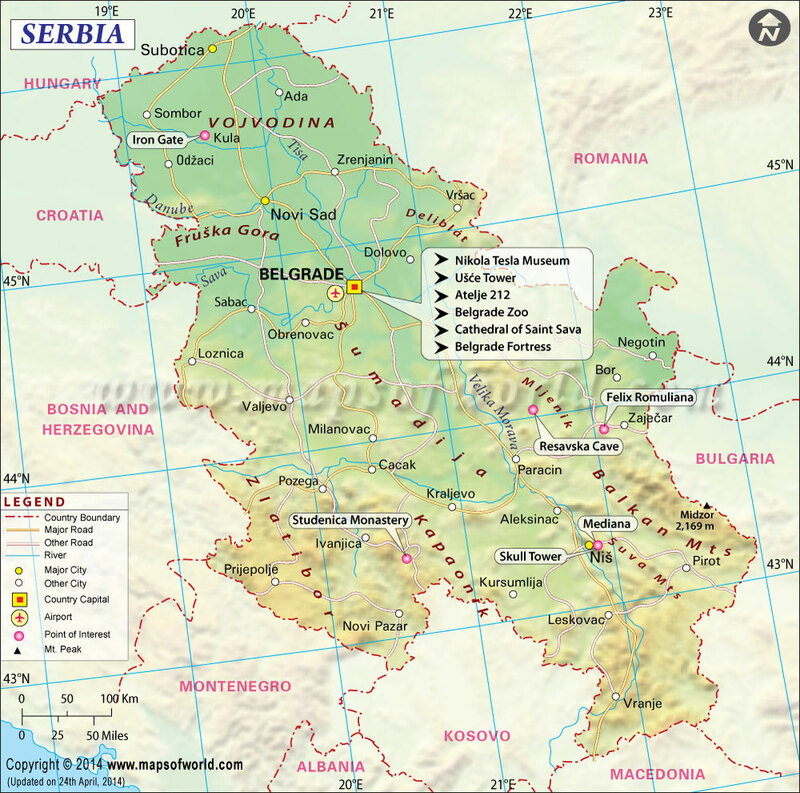 Serbia is located in Southeastern Europe, found within the Balkan peninsula and the Pannonian Plain, which is part of Central Europe. It is a landlocked country with 8 countries surrounding its borders. Hungary is to the north, while Romania is to the northeast, Bulgaria to the southeast, Macedonia to the south, Montenegro and Albania to the southwest, Herzegovina and Bosnia to the west, and Croatia to the northwest. More than 30% of Serbia's land is covered by dense forests. 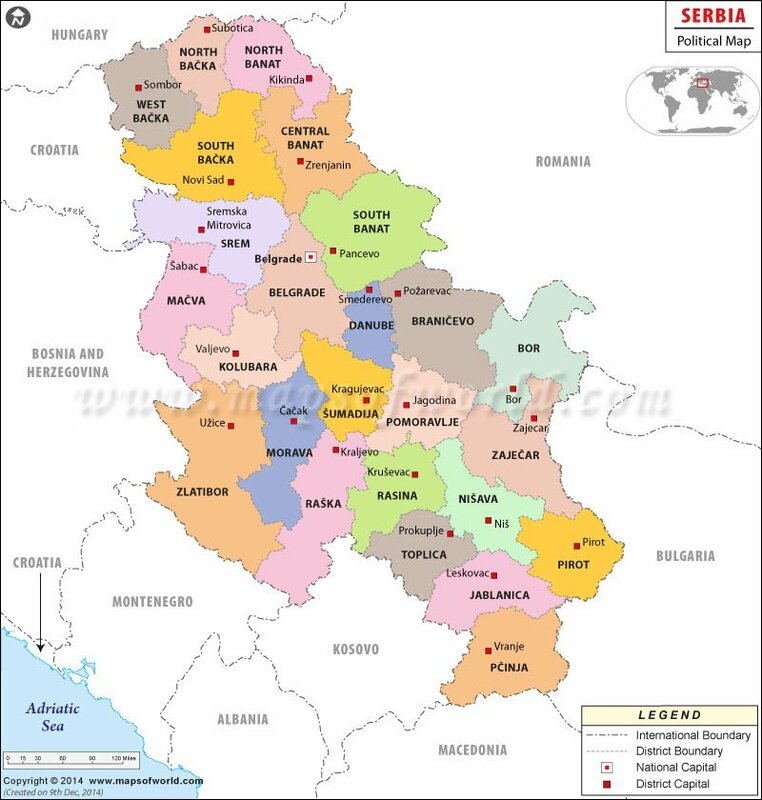 Serbia is a parliamentary republic, with the President as head of state and commander in chief of the armed forces, while the Prime Minister is head of government. The Serbian constitution of 1835 was considered at the time to be the most liberal and most progressive in the world. Since 1835, Serbia has undergone a total of 10 different constitutions. The President is elected to office by popular vote and serves a 5-year term - only a maximum of 2 terms are allowed by the Constitution. The Government is composed of the Prime Minister and the cabinet members, while the National Assembly consists of 250 members who are elected to 4-year terms. Serbia's tourism industry is not a major contributor to the economy but the country still offers an interesting mix of natural resources and historic sites. An average of 2 million tourists travel the country, with half of this number being international travelers. Belgrade is the capital of Serbia and offers a great combination of historical buildings, ancient ruins, and a lively nightlife. It is a great place to find remnants of ancient Roman and Celtic history, with the towering Kalamegdan Castle being the highlight of historic architecture found in the city. The Skadarlija found in the historic Stari Grad district of Belgrade is well-worth a visit for its cobble-stoned streets and attractive architecture. The Novi Sad is rich in culture and famous for being a tourist-friendly city. Found in the north of Serbia, this 3rd largest Serbian city is famous for its Strand Beach, the Petrovaradin Fortress, its city museum, and hundreds of local pubs and bars. It is also the place of the annual Exit Music Festival - a gathering of local, national, and international music acts that play on 26 stages in a 4-day music event. Nis is famous for being the birthplace of Constantine the Great. He built his summer residence, the Mediana, in this city, and ruins of the historic building is open for sightseeing today. Its significant geographical position as being on the road to Istanbul and Greece has made it an attractive city in the past and even until today. Sirogojno is the best rural experience in Serbia. Located on Mt. Zlatibor, the mountain village consists of wood-planked houses, a dairy, a bakery, an inn, and local crafts that produce pottery, knits, and mosaics. Tourists can even take handicraft classes in this village. Serbia's literacy rate is at 98%. Education is divided into 4 parts: preschool, primary, secondary, and higher education, where the 8 grades of elementary level are compulsory. Serbia spends 4.7% of its GDP on the national education expenses. Serbia is the largest exporter of raspberries in the world - a third of the world's raspberries come from Serbia. Most Serbian surnames end with the suffix "ic." The Serbian clock making industry is 600 years older than the famous Swiss clock industry.